My sweet Abby turned seven a few weeks ago, and we finally got around to having her birthday party this last weekend (yes, we're terrible parents). We had a nice brunch with my family and it was fun to celebrate our cute (and growing way too fast!) seven year old. I wanted to make an extra special cake for her, and we decided together that a rose cake would be perfect for her party. Abby is a super girly girl, and loves pink and purple and wants everything to be beautiful. I had originally thought I would just make a vanilla cake with vanilla icing and tint it pink, but when I bought some gorgeous strawberries at Costco for the brunch, I realized they would be perfect in the cake too! 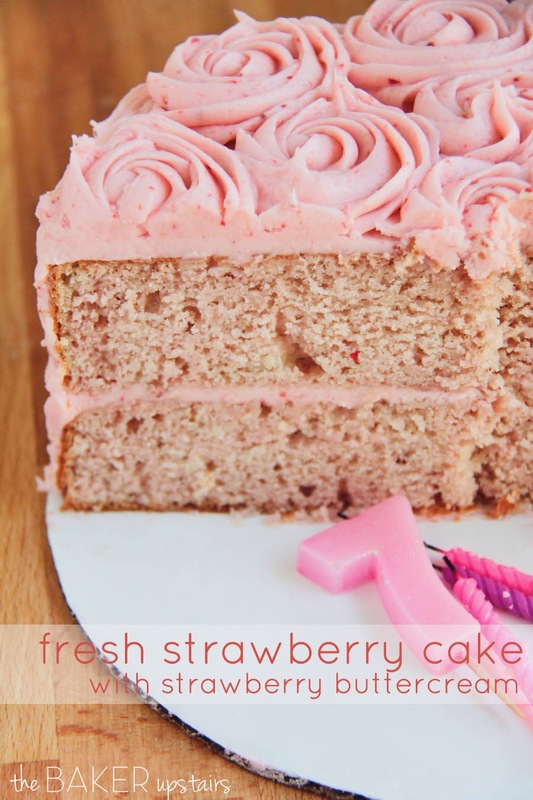 My favorite cake recipe was super easy to adapt using fresh strawberries, and I used my new favorite fresh strawberry buttercream for the frosting. The roses were surprisingly easy to do. Mine are actually quite imperfect, but somehow having them all together hides the imperfections and makes the top of the cake beautiful. (There's an excellent tutorial here from I am baker, one of my favorite sources for delicious treats and gorgeous photos.) I had originally planned to do roses all over the cake, but I ran out of frosting and was too lazy to mix up another batch. I think they're still pretty just on the top of the cake, though. Abby was delighted with her cake, and it tasted as good as it looked! Preheat oven to 350. Butter and flour two 8 inch cake pans. In a large bowl or the bowl of a stand mixer, combine the cake flour, all purpose flour, sugar, baking powder, and salt. Cut in the butter until the mixture resembles coarse crumbs. Beat in the eggs one at a time. In a measuring cup, combine the milk, strawberry puree, and vanilla. Add half of the milk mixture to the flour mixture, and mix to combine. Add the other half of the milk mixture and mix until smooth. Divide between the prepared pans and bake 30-35 minutes, or until a toothpick inserted into the center comes out clean. Let cool completely before frosting. To make the frosting, beat the butter until light and fluffy. Add the salt, powdered sugar, and vanilla, and mix to combine. Add the strawberry puree and beat until light and fluffy. Frost cake as desired. Its still quite amazing! I would hardly say its imperfect. I find homemade cakes often look more appealing to eat than those fancy ones in the Parisienne bakeries! Try reducing the flour by 1/2 cup and using the creaming method to assemble the batter. It makes for a much fluffier (but still sturdy) cake! Thanks, great idea! Will try this now! What's the creaming method mean? Jacquelyn, she means softening the butter and creaming the butter and sugar together, then adding the eggs, vanilla, and milk, and adding the dry ingredients last. I disagree with those directions, though! The method I used above (which is called the reverse creaming method) results in a better texture, with a more even distribution of fat, creating a lighter cake. Did you cook the strawberries with sugar to make the purée? If so, how much? Nope, just puree them. With a food processor or blender. I'm glad you tried it and it worked well for you! Good luck in your cooking adventures! I tested out this recipe this weekend in anticipation of my daughter's 1st birthday party. It was delicious! I'm planning to make this cake for her, and cupcakes for everyone else. Would you suggest any changes in making this a cupcake recipe? Can you use frozen strawberries? Just puree it in a food processor or blender until smooth. No sugar added. Is there any straining involved to remove the seeds? No, I left the seeds in. I made this yesterday for our family Easter celebration and it is SPECTACULAR!!! I will be making this one again and again! Thank you!!! Your cake recipe is AMAZING! I made it Saturday and it came out perfect. Thank you so much! I didn't do the roses, but I think I will next time. Yours are gorgeous! Imperfections, my foot! Do you use salted or unsalted butter in this recipe? Thanks! Salted?? Chefs almost always use unsalted butter rather than salted in cake recipes. Just double checking. Yes. Salted. Feel free to make it with unsalted if that's what you choose. I made it with salted butter and it was delicious. I used a large closed star tip (Wilton 2D). I have found them at Walmart for around $1 each. Alicia- Is there enough frosting to frost the cake and do the roses?? I had enough to frost in between the layers and around the cake, then do the roses on top. I had originally planned to do roses all over the cake, but didn't have enough frosting to do more than just the top. This cake is beautiful and I LOVE the flavor of the icing. However, the next time I make this I will double the icing recipe. I had absolutely not one bit left after icing a 6" cake. I filled the layers with jam so the icing was used only for the crumb layer, sides, top, decoration, and a dam to hold the jam in the layers. From the comments it appears that I'm the only one to have this experience but I would really recommend at least adding half again to the volume. I normally make three layer 10" inch cakes so I will be at the very least doubling the icing. It looks WWO! Definitely gonna try this for my mother's birthday. I got more excited for this cake after reading the comments. Many thanks chef! I stumbled on your frosting recipe while looking for buttercream using fresh berries. It was wonderful! I had already made strawberry cupcakes so didn't try your cakes, but hopefully will another time. I included your frosting recipe in a blog post over on my baking blog - thanks so much for the great recipe! Your cupcakes look delicious! So glad you liked the frosting! Im wanting to make a strawberry cake and a blueberry cake for an event coming up. Your recipe sounds awesome! Is there any reason I cant sub in blueberry for the strawberry to make blueberry cake?? Seems to me like it would work! Thanks! I haven't tried it, but that sounds great! I'm guessing it would totally work. Let me know how it turns out! What would I need to do differently to use this recipe for cupcakes? Thank you! Just scoop into cupcake liners and bake 18-20 minutes at 350. Excited to try this recipe but can you clarify at what speed I should mix the batter and for how long? And how high will the resulting cake layer be? Thanks! can you substitute the butter for margarine in this recipe? will it make much of a difference? I wouldn't recommend using margarine. 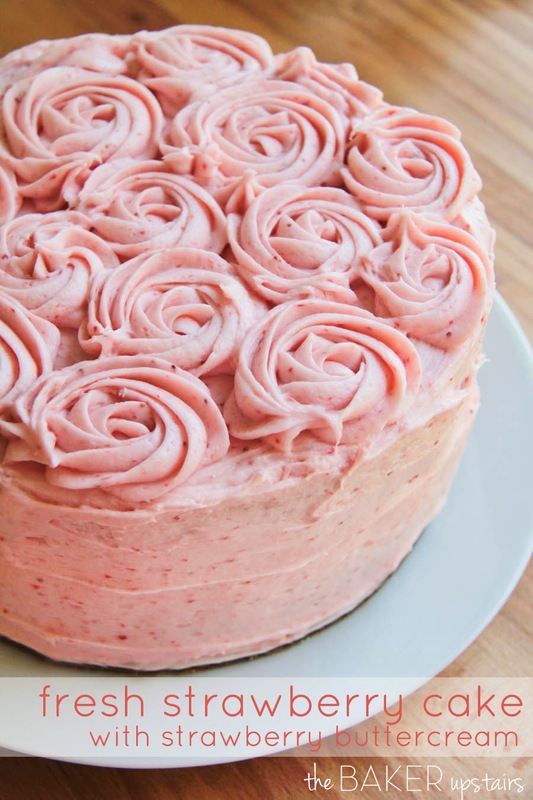 Your strawberry buttercream is my go to strawberry icing since i discovered it a year ago! I make it all year round! This cake looks absolutely Heavenly. My son asked for a strawberry cake for his 8th birthday and this is the one that stood out to me. He said it looks yummy but asked if I child name it les girly. Ha ha ha! I think I'll add fork decorations on top and add cut strawberries. And perhaps a toy car. Ha ha ha. Thanks for being so generous and sharing your recipe! Is it possible to bake the cake in two 9 inch cake pans? If so would the time to bake remain the same? Yes, I'm sure that would work fine. I would guess that the bake time would decrease by a few minutes, because the cake will be a little thinner. I just completed baking & frosting this for my sister's birthday today. I decided to use less sugar in the cake, halved the icing, and put strawberry preserves (from a local source) between the layers. I also decided to use pastry flour rather than cake flour and unsalted butter since I included 3/4 cup sugar. Followed the rest of the recipe as indicated. Purchased the strawberries this morning. The frosting is bomb! I sprinkled Valentine nonpareils on top. I can't wait until this evening to taste it. Even though I'm a middle aged adult, I believe this is the first layer cake that I've made without my mom's supervision/advise. (She passed about 15 months ago.) Usually I make sheet cakes so as not to fiddle with layers, but it wasn't as much of a hassle as I recall. Last year I baked my sister a strawberry cake from a box with vanilla buttercream frosting, but I was determined this year to make one from stratch, and I'm so glad I found your recipe as I attempt to carry on my mom's baking skills. Thank you! Amazing! I've made the cupcakes and cake with this batter, the flavor is amazing! I think I over worked the batter on my cupcakes as they were EXTREMELY dense, but I didn't work the batter as hard for the cake. My icing doesn't look half as good as pictured but man is it good! Next I'm trying fresh peaches! :) Thank you! I want to make this cake for a birthday this coming Friday. Two questions, since it does not have oil in the cake, is it moist? Have you ever added a tiny bit of coconut oil or extra light olive oil which does not have a taste? 2) do you measure your ingredients in this recipe on a scale? I measure everything on a scale. Thank you. Hi. Do you think if I replaced the milk with buttermilk it would still work? I love what buttermilk does to cakes. Yes, I think that would work great! Hi! Can I use almond milk in place of the regular milk? I haven't made it that way myself, but I would guess that it would work! Used this cake recipe to make a unicorn cake for my daughter’s 4th birthday a few days ago. I could not believe how delicious, flavorful, light and moist it was, even 3 days after It was made! I made a cream cheese frosting so the unicorn would be white and added strawberry purée between the layers and in the flowers on top. Already craving this again! I'm trying to do a three layer cake and was wondering by how much you would suggest increasing the ingredients for both the cakes and the buttercream?